Small enough to fit comfortable inside any palm or pocket the Maxi-T is ideal for inspections where space is limited. The Maxi-T uses a purpose designed optical prism to diffuse the UV light produced by the LED emitter to give a relatively wide and uniform beam spread for a product of this type. 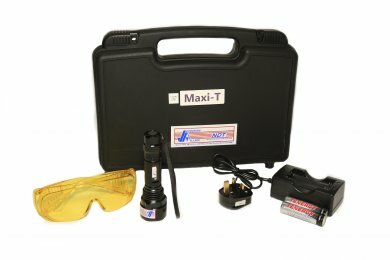 The Maxi-T is supplied in a plastic carry case with foam inserts with 2 rechargeable Lithium ion batteries, battery charger and UV safety spectacles.